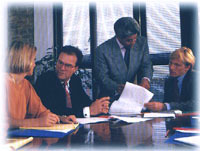 The company has extensive experience in conducting qualitative evaluations and strategic organisational reviews. Projects can be tailored to suit organisational requirements in relation and the objectives that are sought. This could, for instance, when organisational cultural change is required, or a restructure is being considered, a response to the need to demonstrate the achievements and outcomes of service, or there is a need to achieve a strategic change. We offer organisations a range of methodologies that suit differing needs. Tuned In Consultants are experienced in working and producing results within a range of settings including in relation to political and strategically sensitive projects. The Service offers tailored and innovative strategic planning for the government, non-government and private sector. This may include a one off or series of planning sessions, and can incorporate focus groups, coaching and service ‘health’ assessment where required. Known for their inclusive and focused approach, Tuned In Consulting work with you, behind the scenes to ensure your service is heading in the right direction, and that staff and partners feel heard and a part of the future vision. As an Australian-based company, Tuned In Consulting recognises the traditional owners of the land on which we work and pay our respects to elders, past and present.